White paper on crime 2001 Part 1/Chap.2/Sec.3/4. 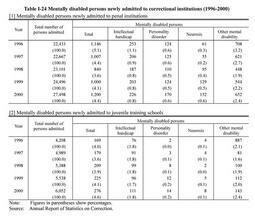 Table I-24 shows the trends in the number of mentally disabled persons or juveniles newly admitted to correctional institutions during the period from 1996 to 2000. Persons who needed special treatment were admitted to medical prisons or medical juvenile training schools and received treatment.